Are you a first time mom ready to navigate the nine months of pregnancy? Congratulations! This journey is one that is unlike any other, full of excitement, nerves and preparation . . . not to mention nausea, back aches, a growing belly and so much more. While not all pregnancies are the same, many symptoms and emotions are. Here’s an inside look at each pregnancy trimester for first-time mamas. The first trimester is full of unknowns. When will my true pregnancy symptoms kick in? What is my first sonogram experience going to be like? Will I start to show soon? How do I keep my pregnancy a secret? What do I need to buy? And the list goes on and on . . . The good news is that you’re not alone in these feelings! All moms to be are going through these exact same thoughts and so many more. To give yourself the best inside look at what to expect throughout pregnancy, do some research. There are tons of great apps to help follow you through your pregnancy–try the Glow Nurture app. Not only are they spot-on with symptoms and major development milestones for baby, but they help you get excited and connect you to other mamas. You can also join our Facebook group for pregnant mamas! There you can ask questions and share your experiences with other moms with bumps in our Baby Chick community. Now, we can’t talk about the first trimester without talking about those early pregnancy symptoms. Yes, everyone’s favorite part of pregnancy — the nausea, sore breasts, headaches, exhaustion, and did I mention the nausea? While not everyone’s experience is the same, some combination of these symptoms typically appears and has you looking forward to that 13 week mark. Speaking of the 13 week mark . . . welcome to the second trimester. Most women welcome this milestone with a growing bump and added energy! For many, your belly may be making its debut and word of the baby’s arrival has been shared with friends, family and possibly colleagues. On that note, if you are a working mom-to-be, now is a good time to talk to your boss and start thinking through your plans for maternity leave. Yes, now. While it may seem far off, there’s a lot to get done before baby arrives — be sure that you know your company’s maternity policy, put some thought into how much time you plan to take and think through how your work will be managed while you are out. So what’s the best part about trimester number two? I found it to be the amount of growth that took place! Your baby is growing — a lot. As you near the end, most likely, he or she will be weighing in around two pounds. This growth brings such a fun feeling — literally! Baby will be moving, kicking, and throwing a few jabs inside. This daily movement makes everything seem so real and exciting. 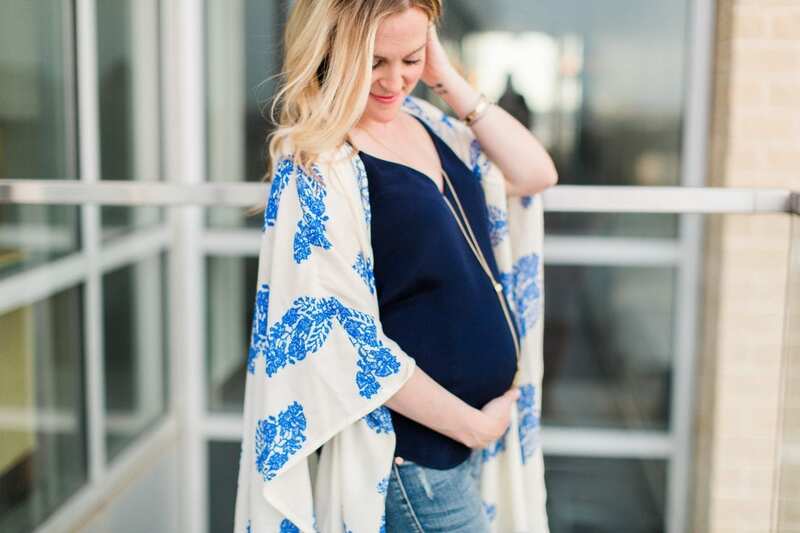 Speaking of growth, now is a good time to invest in maternity clothing if you haven’t already. From staple items such as a belly band or maternity leggings to cute items that you can wear to your baby shower, there’s plenty of options and price ranges to get you through the remainder of your pregnancy. What else can you expect in the second trimester? An anatomy scan! Around the 20-week mark, your doctor will order a sonogram to ensure that baby is healthy. Not only will you get to go home and decorate your refrigerator with baby’s sonogram photos, but, at this point you can also find out the gender. Cue the tough decisions. Do you even want to find out the gender? Should you have a gender reveal party? And what will you name the baby? Once you make your way into the third trimester, one thing is certain, you are not able to hide your pregnancy any more — and you shouldn’t! The third trimester often brings with it excitement paired with nervousness. Why? Because you are getting closer and closer to meeting your sweet baby. To help you prepare, consider signing up for classes, such as a labor and delivery class, newborn care class or a breastfeeding class. The more ready you feel, the more ready you will be! During this time, don’t forget to utilize one of the best resources available to you, your OBGYN or midwife. As you get closer to your due date, the number of appointments that you attend will increase. Of course this is to ensure that both mom and baby are healthy, but it also provides you with the opportunity to ask as many questions as you need. What else can you expect with trimester number three? The lovely return of some familiar symptoms, paired with a few new ones as well — backaches, soreness, insomnia, exhaustion, lightheadedness, heartburn, and so on. While this growing list may look intimidating, just keep in mind you are almost to the finish line, and after all, every symptom will be worth it!